Marketed by HäT as the Skoda 75mm Mountain Gun, it's proper designation is 7.5cm Skoda Gebirgskanone M.15. 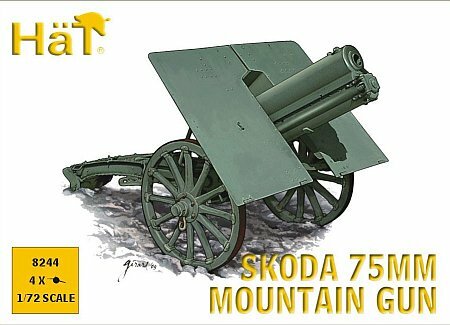 Manufactured by Skodawerke Actien-Gesellschaft (aka Skoda), it was the most numerous, important as well as the best mountain gun of the Austro-Hungarian Army in World War One. 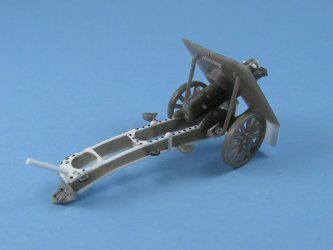 Designed as a mountain gun it was built as lightly as possible and could be disassembled into 5 parts: carriage, inner barrel, outer barrel, cradle and shield. The Austro-Hungarian Army liked the design enough to keep it in production until the 1930s and it even served in the early years of World War Two. It was also used by the Germans during World War One, not as a mountain gun, but as a mobile close support gun. In this role it proved to be less robust than the Germans liked. The Germans seldom disassembled it because there was usually no need for that on the Western Front. As a result the guns suffered more abuse on the bumpy marches while still assembled resulting in premature wear on the gun's major parts. Inside the box you get four identical sprues in hard grey styrene plastic. Each sprue has just 8 parts. Instructions come as a simple exploded diagram on the back of the box. No decals are included. The parts themselves are typical for these simple war gaming kits from HäT, being somewhat softish. The larger parts have a noticeable orange peel like texture. Small seams are present on most parts though there's no extra plastic flash to speak of. Detail is a bit disappointing. The wheels have only 5 lugs nuts while period photos show six, and restored museum examples have twelve (which makes me believe that the wheels on the museum pieces are not original or maybe from guns produced post First World War). The kit's shield does have some rivets but not as many as it should, though this is not a big issue. The largest problem comes with the trail. The kit has it molded with flat sides, which is not correct. 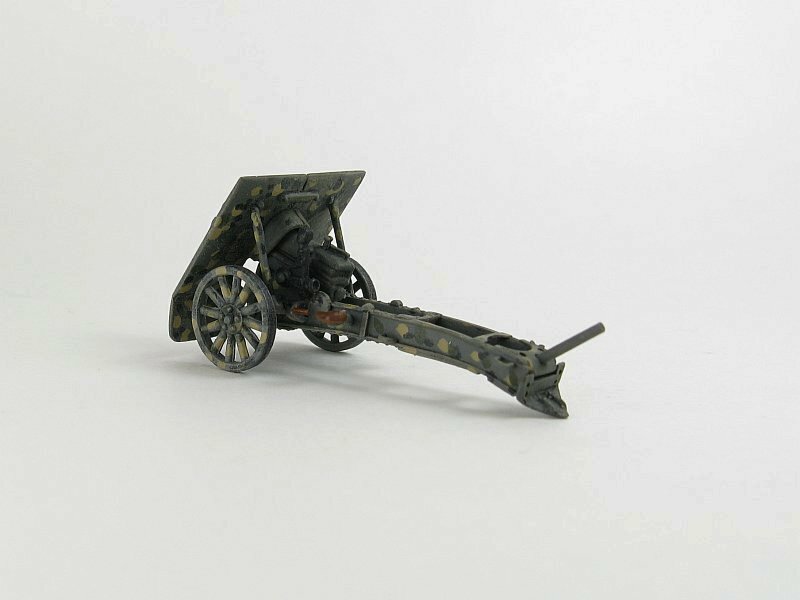 The real gun exhibits very prominent edges that I believe are the result of the carriage being made from stamped metal, versus cast metal, in an effort to limit the gun's weight. With so few parts, building this kit out-of-the-box would be a snap, but I rarely built 100% out-of-the-box. I had to address as best as I could the shortcomings of the base kit. The first item tackled was thinning the edges of the shield. With minimal detail to worry about this went quickly. The next modifications involved removing the kit cross-bracing on the carriage legs. Then I scraped and sanded flat the carriage's sides - both the inside and outside, as well as the top and bottom. This removed some of the kit's detail which I planned to add again later. Replacement braces were added from some very thin strips cut from some plastic sheet. After the glue had set they were sanded to reduce their width and thickness. New cross-braces were fashioned from thin plastic sheet as well and glued span wise across the top and bottom of the trail. Some diagonal braces were added between the legs as well. Some of this was guesswork as I didn't have any proper photos of the underside of the carriage to refer to. The spade was cut from the trail and the gap was spanned with some rectangular plastic rod. The spade was drilled with a pair of holes on each side (there should be three holes on each side but I didn't have a drill bit small enough to do this). A section of half round rod was glued to the rear of the trail. All the replacement parts were sanded to remove seams and then the spade was glued back into place. A hole was drilled in the end for a traversing rod, this being made from a short section of plastic rod. Added lift loops bent from thin wire to the trail. Some thin plastic sheet was cut to make the missing extensions that hang below the shield. Hinges were added using thin plastic rod. More thin plastic rod was used for the aiming wheel (for this gun the aiming wheels are actually just comma shaped rods) shafts and handles. I cut off the end of the barrel and replaced it with a new tip made from a plastic rod, and then the barrel was drilled out. The plastic of the barrel was odd in that my attempts at sanding and scraping to make it more round resulted in the plastic peeling away under my knife. I had to brush liquid glue over it to get the plastic to set properly. My sanding removed the front supports(?) which were replaced once again with thin plastic rod. 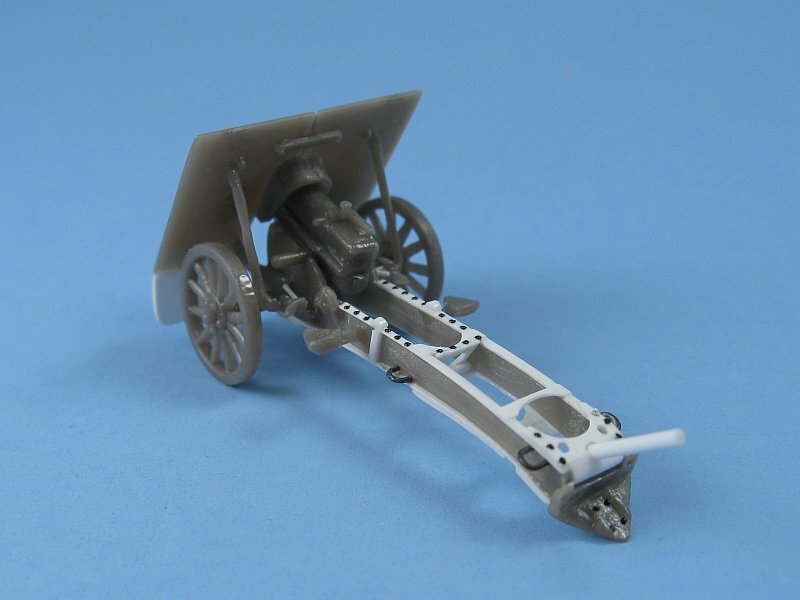 A brace made from plastic rod and sheet was added to the right axle as per the reference photographs. The final touch was to add rivets from Archer Fine Transfers. 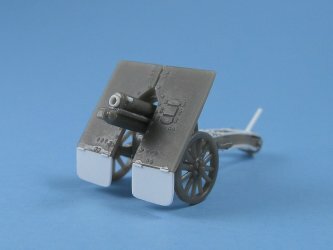 I had planned to build the gun with the barrel as a separate assembly but was unable to do so as the gun would not fit through the shield if it was in place. 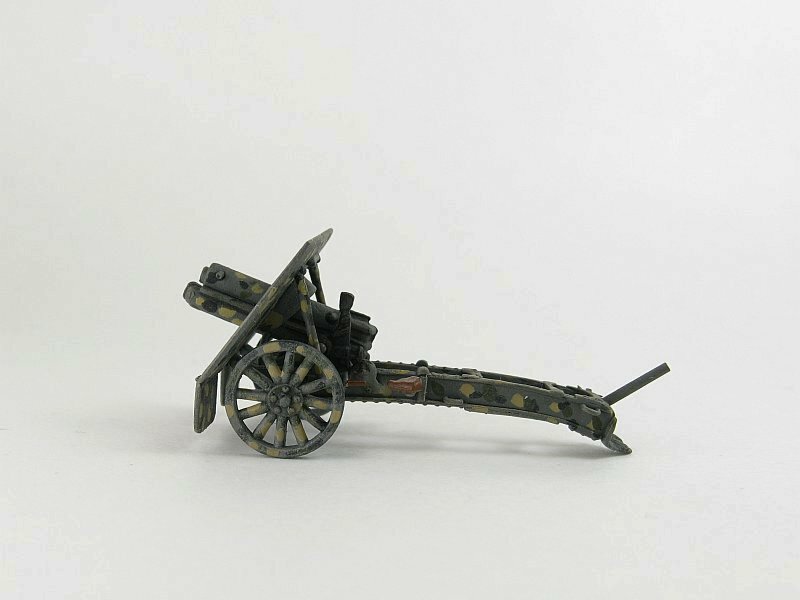 The box top picture serves as the painting guide and shows the gun in an overall greyish green camouflage which I assume is the colour that the Austro-Hungarian Army would have used in World War One. It may even be the colour for a German gun as well. While the box top art is catching and provides some guidance regarding colour it would have been nice to have some sort of callouts for the major paint manufacturers to ease paint selection. For my gun I decided to go with something other than the drab monotone finish suggested on the box top. 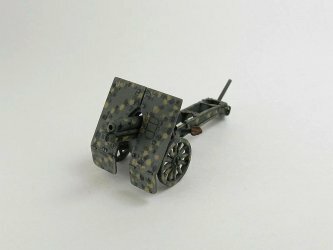 On the Landships II  site I found a nice article on the dapple camouflage used by the Germans in the First World War. I found no proof that this gun would have been camouflaged this way but the scheme appealed to me and it would make the model stand out amongst the other guns on the display shelf. After my initial light grey primer I applied a base coat of Aeromaster RLM Graugrun with an overspray of the same lightened with some white. The dapples were Testors Flat Black, Middlestone and Aeromaster RAF Dark Green. To make the dapples I experimented with something different. I cut some short thin strips cross wise from a leather lace and used the pointy tip to apply the spots. I found that as I applied the dots, the tip would flatten over time due to paint absorption and the spots applied would grow in size, which actually improved the look of the dots. The only thing I didn't like was that the leather strips sometimes applied too much paint and the drops would become noticeably thick after they dried. To fix this I lightly sanded the face of the shield to level the paint. As a quick build this gun is quite acceptable. As a display model, not so much. As you can see there are some shortcomings with the kit, though none too serious that some basic construction skills and time expenditure couldn't fix. 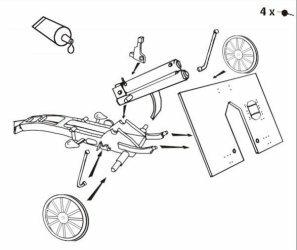 With four kits in the box you'll have some spares to fall back on should you make an error along the way. 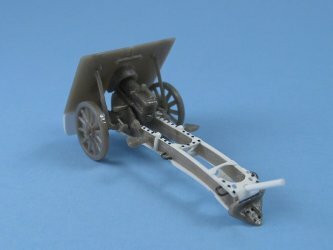 And the extra wheels can be used to scratch build some simple farm carts for a diorama as well.